The term 'refractory metal' is used to describe a group of metal elements that have exceptionally high melting points and are resistant to wear, corrosion, and deformation. The identifying feature of refractory metals is their resistance to heat. The five industrial refractory metals all have melting points in excess of 3632°F (2000°C). The strength of refractory metals at high temperatures, in combination with their hardness, makes them ideal for cutting and drilling tools. Refractory metals are also very resistant to thermal shock, meaning that repeated heating and cooling will not easily cause expansion, stress, and cracking. The metals all have high densities (they're heavy) as well as good electrical and heat conducting properties. Another important property is their resistance to creep, the tendency of metals to slowly deform under the influence of stress. Owing to their ability to form a protective layer, the refractory metals are also resistant to corrosion, although they do readily oxidize at high temperatures. Due to their high melting points and hardness, the refractory metals are most often processed in powder form and never fabricated by casting. Metal powders are manufactured to specific sizes and forms, then blended to create the right mixture of properties, before being compacted and sintered. Sintering involves heating the metal powder (within a mold) for a long period of time. Under heat, the powder particles begin to bond, forming a solid piece. Sintering can bond metals at temperatures lower than their melting point, a significant advantage when working with the refractory metals. One of the earliest uses for many refractory metals arose in the early 20th century with the development of cemented carbides. Widia, the first commercially available tungsten carbide, was developed by Osram Company (Germany) and marketed in 1926. This led to further testing with similarly hard and wear resistant metals, ultimately leading to the development of modern sintered carbides. The products of carbide materials often benefit from mixtures of different powders. This process of blending allows for the introduction of beneficial properties from different metals, thereby, producing materials superior to what could be created by an individual metal. For example, the original Widia powder was comprised of 5-15% cobalt. 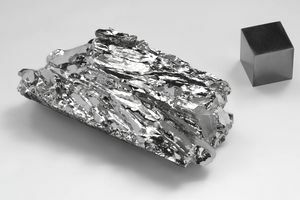 Refractory metal-based alloys and carbides are used in virtually all major industries, including electronics, aerospace, automotive, chemicals, mining, nuclear technology, metal processing, and prosthetics.